Bold, daring, and ahead of their time, women of the Ohio River helped pave the way for progress and furthered women’s progress. Visit Louisville and SoIN attractions to discover their important role in the Ohio River valley. Four area historical attractions, The Mary M. Miller steamboat, The Culbertson Mansion, The Falls of the Ohio, and The Carnegie Center for Art and History, have women at the helm whose careers involve sharing and preserving stories of great women. Kadie Engstrom is the Education Coordinator at the Belle of Louisville Riverboats. She has made Louisville and SoIN river history her livelihood for 46 years. Kadie loves to answer passengers’ questions while aboard the Belle of Louisville or the Mary M. Miller, the newest addition to the Belle family. 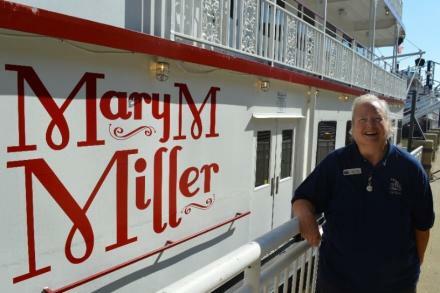 The Mary M. (as Kadie affectionately calls her) was named after Louisville-native and first woman steamboat captain, Mary Millicent Miller. A woman steamboat captain was unheard of in the mid-1800s and Mary’s license application was very controversial. Her skill, knowledge and perseverance gained national attention, and on February 16, 1884, Mary became Captain Mary M. Miller. Learn about Mary M. Miller the woman when you go on a Mary M. Miller boat cruise with Kadie Engstrom. Dani Cummins has been with the Falls of the Ohio Foundation since 1991. As Executive Director, Dani supports the Falls of the Ohio State Park with fundraising from memberships and special events. The Foundation’s efforts are crucial to the Falls of the Ohio’s story and continuing success. 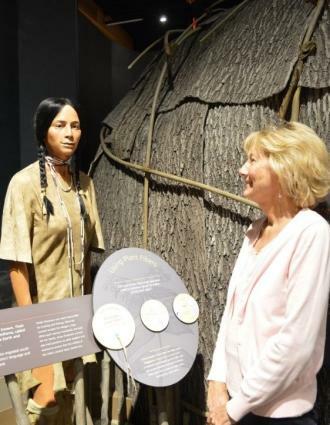 The Shawnee once lived in our area, and their story is shared at the Falls’ Interpretive Center. Much like Dani, Shawnee women held positions as leaders. Their purpose was to make sure the wishes of the tribe’s council were carried out. Women also tended to the crops, keeping what they harvested for their families. Dani’s great work with the Foundation has yielded a great harvest for the Falls of the Ohio. In addition to the Interpretive Center’s recent renovation, a new website and orientation film are in the works. Jessica Stavros, Development Officer for Historic Sites, tends to ten sites throughout Indiana. One of them is the Culbertson Mansion in New Albany, where she uses her time and talents to share the William S. Culbertson story and restore the mansion’s glory. Like Jessica, William’s second wife Cornelia Culbertson was known for contributing her time and talents to causes she was passionate about. Described as “community-minded,” Cornelia worked for many years to form a New Albany orphanage. The Cornelia Memorial Children’s Home was formed in 1882 and operated until 1943. When a portrait of Cornelia returned to the 20,000-sq.-ft.-mansion in 2015, it was an important milestone. 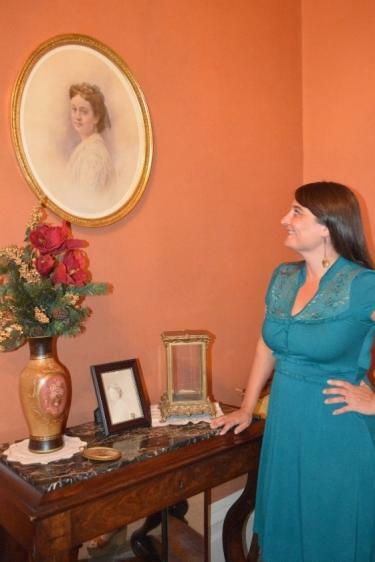 When you visit, be sure to see Cornelia’s restored portrait on the second floor; Jessica and the Culbertson Mansion staff love to share its story. Sally Newkirk began her journey with the Carnegie Center for Art and History in 1981 and became its director in 1988. She considers her staff and the SoIN community her family, and loves sharing the unique stories behind Carnegie’s exhibits. One of those stories includes the life of Lucy Higgs Nichols, featured in the permanent exhibit, Remembered: The Life of Lucy Higgs Nichols. Borne from the research of local Underground Railroad historian Pam Peters, it chronicles Lucy’s brave and extraordinary life as a slave, Civil War nurse, and freed woman. The exhibit highlights her six-year battle for her nurse’s pension, which was awarded through a special act of Congress. You’ll see a real Civil War Enfield rifle, amputation saw, and one of only two known photos of Lucy. In the 1898 photo, Lucy is surrounded by “her boys” at an annual reunion of the 23rd Indiana Volunteer Regiment. 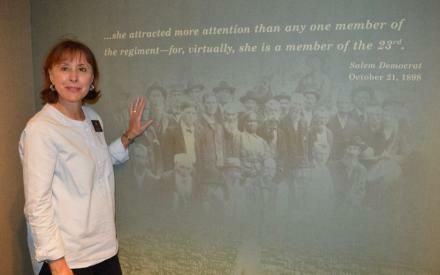 Sally cherishes that photo, but more so, the real-life story of a woman who unselfishly served others. Bonus: Listen to a narrative of the Lucy Higgs Nichols story HERE. For more info on these and other historical attractions in SoIN and nearby Louisville, KY, click HERE.